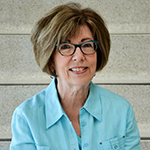 Dr. Linda Baker is a psychologist and Adjunct Faculty member at the Faculty of Education at Western University and is the Learning Director at the Centre for Research & Education on Violence Against Women & Children. Linda leads the Learning Network and the Knowledge Hub. The Learning Network, funded by the Government of Ontario, translates knowledge on the continuum of gender-based violence for service providers with a focus on Ontario-based resources. The Knowledge Hub, funded by the Public Health Agency of Canada, facilitates a trauma and violence informed community of practice with 38 researchers and practitioners conducting innovative intervention research across Canada. Linda is a clinical psychologist with expertise in child and family interventions, court related clinical assessments and services, and children and adults affected by domestic violence. She has co-authored numerous resources related to gender-based violence at different life stages and across the life course. Linda participates regularly on faculty teams delivering Domestic Violence Institutes for the National Council of Juvenile and Family Court Judges and Futures Without Violence throughout the United States. She has been invited to speak and facilitate workshops in her areas of expertise in North America, Europe, and Asia.